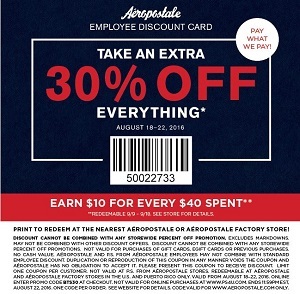 Print the coupon which allows you to receive 30% discount on everything, bring it to your nearest Aéropostale store location in the U.S. and end enjoy the offer. Plus, earn $10 for every $40 spent. Show Aéropostale coupon to cashier during the time of your purchase. Source of the information is Aéropostale.The offer is valid until August 22, 2016. For more information visit any Aéropostale store location in the U.S.